Undated design plan for Transport # 1 prepared during early 1915 in support of planning for ships that might be built in Fiscal Year 1917. This drawing reflects the concept selected for construction of the Henderson (Transport # 1), funded in Fiscal Year 1913 and completed in 1917. Henderson was designed in cooperation with the Marine Corps for the purpose of carrying Marine combat troops and their support, including horses and mules (note the inclusion of a "stable" on the Second Deck forward). No new transports of this type were built, despite Congressional funding of a second, similar ship in Fiscal Year 1918 (see Photo # S-584-087). 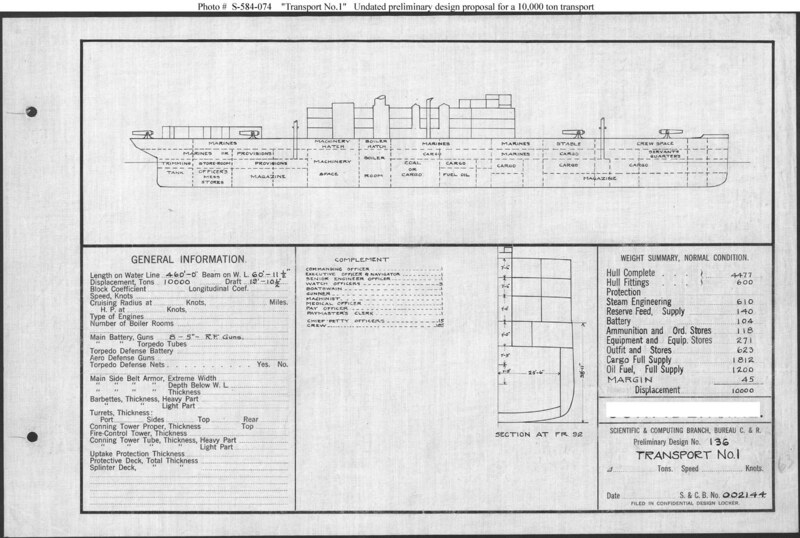 This plan provides eight 5-inch guns in a ship 460 feet long on the water line, 60 feet 11-1/2 inches in beam, with a normal displacement of 10,000 tons.